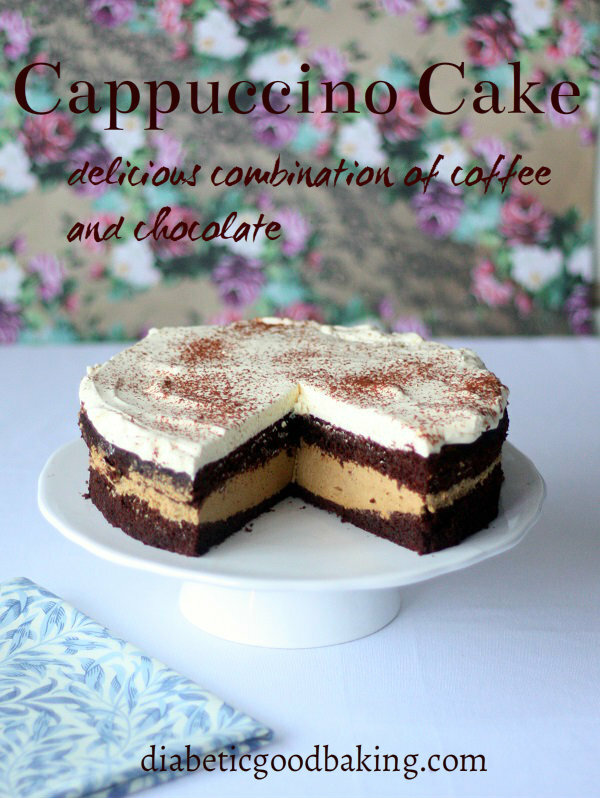 If you like coffee and chocolate you will love this beautiful, layered cake that imitates cappuccino. Chocolate cake combines nicely with coffee flavoured cream and a layer of whipped cream. The cake is very moist and rich. Tastes delicious with a cup of hot and strong coffee. · Preheat oven to 170 C and line spring form tin with baking paper. · Melt the chocolate in a bowl over simmering water and set aside to cool down a bit. · Using electric hand mixer beat the butter. Add Xylitol and melted chocolate. · Separate egg yolks from whites. Add yolks to the chocolate mixture, one at the time mixing continuously. · Sift the ground almond, soy flour, baking powder and soda and add to the mixture. · Beat the egg whites and mix very gently with the chocolate mixture. · Bake for about 25 – 30 minutes. Check with a skewer if the cake is baked (the skewer should come out clean). Let it cool down and cut in half lengthwise. · Dissolve gelatine in ¼ cup of hot water. Let it cool down slightly. · Dissolve coffee in one tablespoon of hot water and mix with mascarpone cheese. · Whip the cream and add Splenda together with dissolved gelatine mixing continuously. · Add the cream mixture to the mascarpone cream. · Whip the cream and add Splenda. Spread the coffee cream on a layer of the chocolate cake. Cover with the second layer. Spread the whipped cream on top and sprinkle with cocoa powder or coffee.